Peace out butternut squash! It’s a new week, new destination, new ingredient. 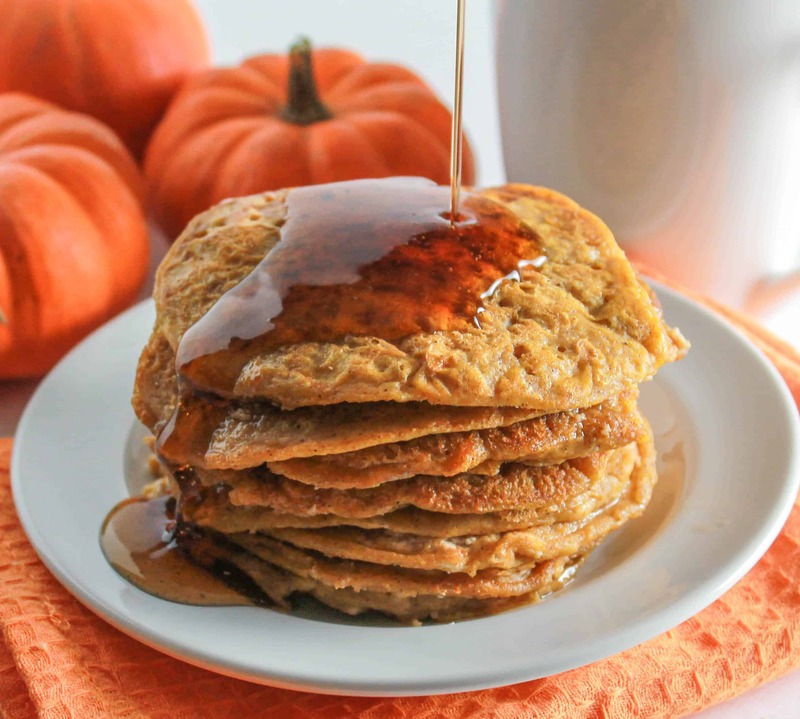 I present to you today: a pumpkin pancake recipe. Because I’m sure you haven’t seen many of these around the interwebs lately plus you’re not at all sick of pumpkin everything, yet. Right? Here’s the deal with my take on the pumpkin pancake. It contains cheesecake so it kind of tastes like a decadent dessert. And I’m up for eating dessert at breakfast any day! Now, is this something you’ll be able to just whip up for Saturday morning breakfast with the fam? Perhaps. Especially if you’ve got a pumpkin cheesecake craving that you just can’t kick. Totally speaking from experience here, except mine happened on a Friday night. Anyway, I’d save this one for a special brunch or perhaps for when you have company in town. The reason being –It takes a teeny bit of night-before prep to yield the finest pumpkin cheesecake pancake. It will take you all of 5 minutes to throw together the cream cheese, pumpkin spice, and honey. But doing it the night before is key. Why? Because those lovely lumps of cheesecake need to freeze so they stay lovely and lumpy when you make the pancakes. 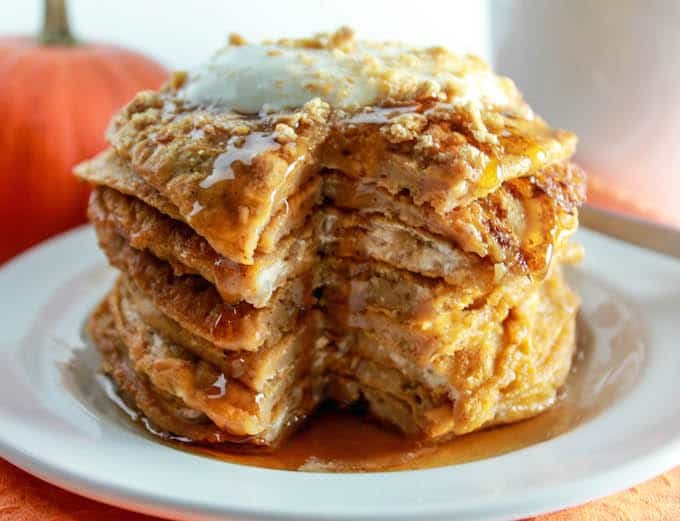 Who wouldn’t want to bite into a fluffy pumpkin pancake and then get hit with a mighty clump of pumpkin cheesecake mid-bite? How do I know the night-before prep is key? Because I’m crazy and made this recipe twice over the weekend. (p.s. you’re all invited over for pancakes!) The first time I made this, I let the cream cheese mixture freeze for about 2 hours. The results? The cheesecake pieces started to soften as I cut them and by the time they made it to the batter, they started to blend in, which isn’t a bad thing. The first few pancakes had the cheesecake clumps, but subsequent cakes were lacking. BUT, the flavor was still outstanding! If you’re short on time, you could totally go this route. The second batch contained the frozen overnight pieces. Grab a sharp knife and hack away at the frozen block of cream cheese. You’ll get perfect bite-size pieces that will stay intact throughout the cooking process. And, of course, the pancakes will be perfecto. Enjoy with a warm cup of joe! My husband, Dan, and I had a little tasting session, and this is what happened. The plan was to just taste that missing column of pancake. Oops. One more thing. IF there are leftover pancakes and you want to make this into a dessert, heat some up and slap a scoop of vanilla ice cream on top. Wow. mmm hmm. yup. 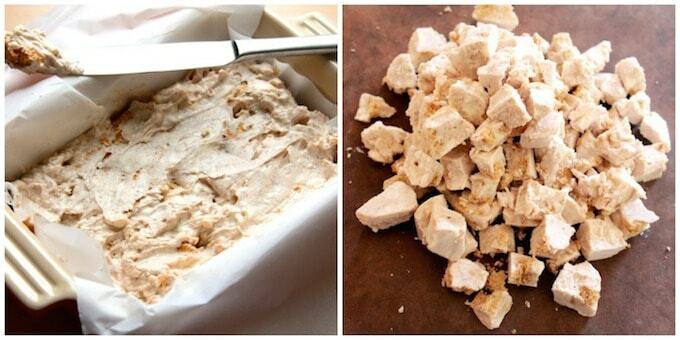 In a small bowl, combine the cream cheese, greek yogurt, graham cracker pieces, pumpkin pie spice, and honey. Transfer the mixture to a freezer-safe container lined with parchment paper. Freeze for at least 1 hour. Overnight is ideal. In the meantime, prepare the pancake batter and toppings. In a large bowl, combine the pancake mix, canned pumpkin, water, and pumpkin pie spice. Store in the refrigerator. For the toppings, crush 1 graham cracker sheet. I placed it in a plastic snack-size bag and pounded it with my fist. In a small bowl, combine the greek yogurt and honey. Store graham cracker and yogurt in the fridge until you're ready to serve. Take the cream cheese mixture out of the freezer. Slice into or break off tiny pieces and toss them into the pancake batter. Mix thoroughly. Heat a large non-stick pan over medium heat or fire up your griddle. Use a ¼ cup measuring cup to portion and pour the batter into pan. Cook pancakes on each side until golden brown. Serve with a dollop of greek yogurt/honey, a sprinkling of crushed graham cracker, and your favorite syrup. Makes 18 pancakes. Hi there! This recipe sounds delicious and perfect for my little family of two. I can’t wait to try it and surprise my husband but I am confused about the measurement for the pancake mix. 11/5 cups? Do you know what the flour amount would be instead of the pancake mix? Hi Alexus, I’m not entirely sure since I didn’t test the recipe using a homemade pancake mix. 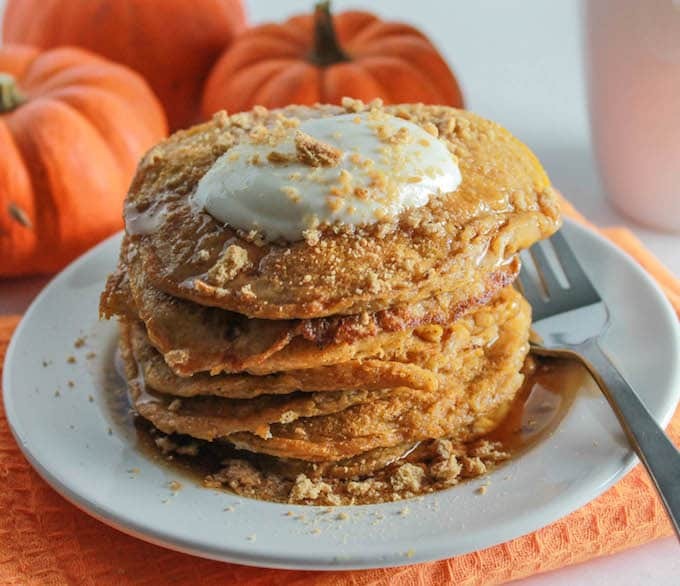 I’d do a search for pumpkin pancake recipes to find instructions for a homemade batter and then follow the portion of my recipe for making and incorporating the cheesecake pieces.